Hey JB fans in Europe! Here’s the announcement you’ve all been waiting for! The dates are set, and Jonas Brothers are officially heading to Italy, Switzerland, The Netherlands, Belgium and Ireland in November! As always, Team Jonas members get an early opportunity for tickets. Not a Team Jonas member yet? Access to early presale tickets is just one of the many benefits of membership. Get all the details here and join today! Click Here for questions concerning the presale. For a list of all Tour dates and more info, visit the Tour section of the fan club site. Regular on sales for these shows begin Friday 22 May, and 23 May for Zurich and Antwerp. 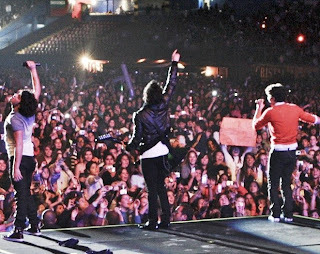 Remember that Team Jonas is a fan club, not a ticket club. Premium and Community Membership includes access to ticket presales, but Team Jonas cannot guarantee location or availability. Please follow the instructions for a better presale experience, and good luck! Please Note: the Meet and Greet contests for these shows on the tour will begin the week of June 8, so stay tuned to TeamJonas.com (aka JonasBrothersFanClub.com) for that info as well as more show announcements, including additional European presales!